Engaged couples could spend an entire day creating their Indianapolis engagement photography album at the Indianapolis Museum of Art. With extensive grounds totaling over 150 acres, the museum is home to a variety of garden settings, an historic palace, fountains, manicured lawns, and wild natural landscapes. Start your shoot on the Sutphin Mall. This area is a vast green expanse with lines of trees and the beautiful Sutphin Fountain at its head. Take some posed portraits with your fiancé in front of the gushing fountain or with the pristine turf at your back. On the opposite side of the Sutphin Mall sits Robert Indiana’s LOVE sculpture, a perfect accessory for your Indianapolis engagement photography session. The groom can scoop up the bride in front of the sculpture for some entertaining shots, or your photographer can catch you kissing with the word LOVE spelled out in the background. Next, explore the other areas on the museum grounds. Try heading over to the Oldfields Estate, where the elegant Lilly House stands watch over the verdant landscape. The estate’s gardens roll out on either side of the building, allowing guests to meander through tufts of colorful blossoms and past gorgeous stone statues using stone-paved pathways. Oldfields is also home to a restored orchard, with thriving fruit trees and vegetation. 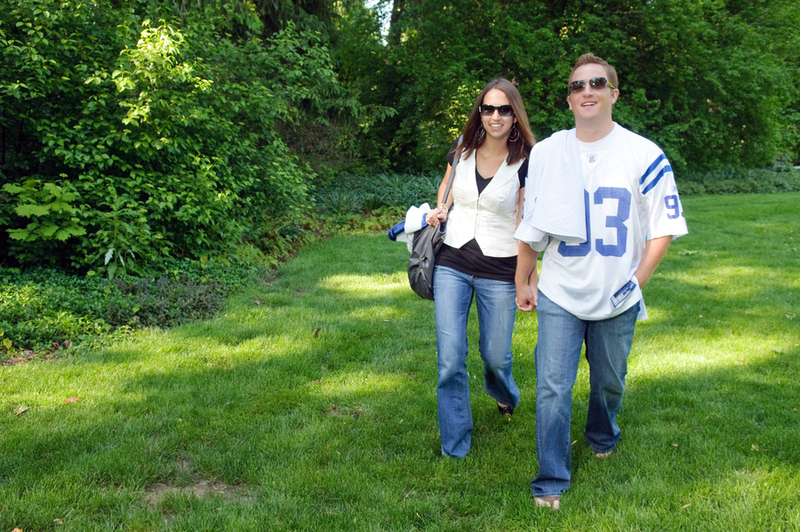 Stroll with your partner through the orchard while your photographer captures candid shots. You and your fiancé will undoubtedly find plenty of places to score some great engagement photographs across the museum grounds. No matter which sport you favor, you will find a venue in Indianapolis. Engagement photographers can follow you out on a game day date at one of your favorite spots to capture some entertaining moments. If you are an avid baseball fan, catch a game at Victory Field, home to the Indianapolis Indians. Your photographer will get shots of you and your fiancé swilling beer and noshing on some of the stadium’s concessions, or waving your foam fingers to cheer on your team. A day before your photo session, submit you and your fiancé’s names and wedding date to run on the scoreboard during the game, then have your photographer capture the special moment when your fiancé sees your romantic gesture! For racing followers, you will not find a better venue than the Indianapolis Motor Speedway, the world’s greatest raceway. While some photography equipment is not allowed in the stands, like tripods and monopods, your photographer can still get some great shots of you and your honey cheering as the cars race toward the finish line. Your photographer can get some interesting shots by leaving the shutter open while the cars swoosh past—making them into blurred, colored lines behind you. If you are feeling extra adventurous, make reservations for one of the Speedway’s On Track Experiences, like one of the coveted Grounds Tours or get the experience of racing a real IZOD IndyCar Series Car. Your engagement photographer can document your date for posterity, and so you and your fiancé can always remember this adventure leading up to your special day. Football lovers will enjoy taking in a game at the Lucas Oil Stadium, home to the Indianapolis Colts. The roof is easily opened or closed, so on a bright, sunny game day you can count on having a clear blue sky overhead. Truly dedicated fans can break out their face paint and get some entertaining candid shots of you and your partner sports nut enjoying the game. Sports-themed Indianapolis engagement photography is an untraditional, unique way to blend you and your partner’s character with your engagement images, and you will be glad you have these game day moments to fill your photo albums. For a couple that is long on humor and short on time, try taking your Indianapolis engagement photography at The Children’s Museum of Indianapolis. Feel like a kid again as you and your fiancé walk through the kid-friendly exhibits. Entry is $15.50 per adult for the entire museum, so take advantage by visiting as many exhibits as possible while your engagement photographer follows behind you and captures all of the fun. Visit the Dinosphere for encounters with some towering, extinct reptiles, or get pictures of the two of you riding the gorgeous early 20th century carousel. The museum collection includes a historic train, maze of mirrors, and a host of other fun activities. Smiles and laughs are contagious, so when you look back on your engagement photo session you will have be grinning from ear to ear. Hitch a quick ride over to the City Market to close out your Indianapolis engagement photography session. Peruse the varied stalls and wares, posing near colorful fruit and veggie displays or holding hands as you navigate through the throngs of shoppers. Play hide-and-seek among the vendors and your photographer can capture candid pictures of your playful antics. By the end of the day, like most children, you will be worn out from all the fun—but you will have fabulously fun engagement pictures to show off to family and friends!